Incense is a great way to cleanse your home. All sorts of things bring negative energy into your home—bad thoughts, arguments, stress, and more. That’s why it’s important to cleanse your home when you first move in and whenever you feel negative energy. You want your home to be a relaxing place where you feel safe. Take a look at these five things you can use to spiritually cleanse your home. The most common way to spiritually cleanse your home is with herbs. The best herbs to use include basil, cedar, chamomile, cinnamon, clove, eucalyptus, fennel, flax, frankincense, lavender, myrrh, peppermint, rosemary, sage, and thyme. However, this is not a comprehensive list. Talk to an online psychic if you want help determining the perfect herb combination to cleanse your home. Then place these herbs in containers around your home to enjoy their cleansing power. 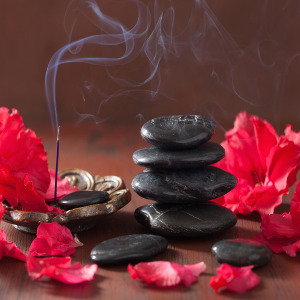 Instead of simply placing herbs around your home and waiting for their powers to permeate and cleanse your home spiritually, you can take a more proactive approach with incense and smudgings. A smudging of dried sage leaves gives off great cleansing energy. You can also buy or make incense out of the same herbs mentioned above. One of the best neutralizers from nature is sea salt. You can place sea salt around your home in dishes or satchels to clear the negative energy from your home. Try to get pure sea salt from a health food store. If you can’t find that, opt for unrefined sea salt because you want to retain its natural properties. Sea salt can be used alone to cleanse your home, but it works best when mixed with other cleansing herbs. Many crystals and gemstones have protective properties that can cleanse your home. The most common ones used include amber, amethyst, black onyx, Coral, emerald, garnet, obsidian, ruby, and tourmaline. Place these crystals around your home to enjoy their protective power. Some gems and crystals can even be charged for better cleansing power. You can use almost any object to help spiritually cleanse your home. You just have to charge it with white light first. You do this by taking the object in your hands and imagining a strong, protective white light surrounding the object. You can actually do this around your entire house, but it’s best to practice on one object first until you get good at it. When your object is super bright and glowing, it creates a barrier to negative energy. This leaves your home protected and cleansed. All of these are great things you can use to cleanse your home spiritually. However, if you feel that your home still needs extra help, consult an authentic psychic. Sometimes the negative energy in your home is coming from ghosts or other spirits that need a little extra push to remove. Your psychic will know the best approach to take for your particular home and situation.